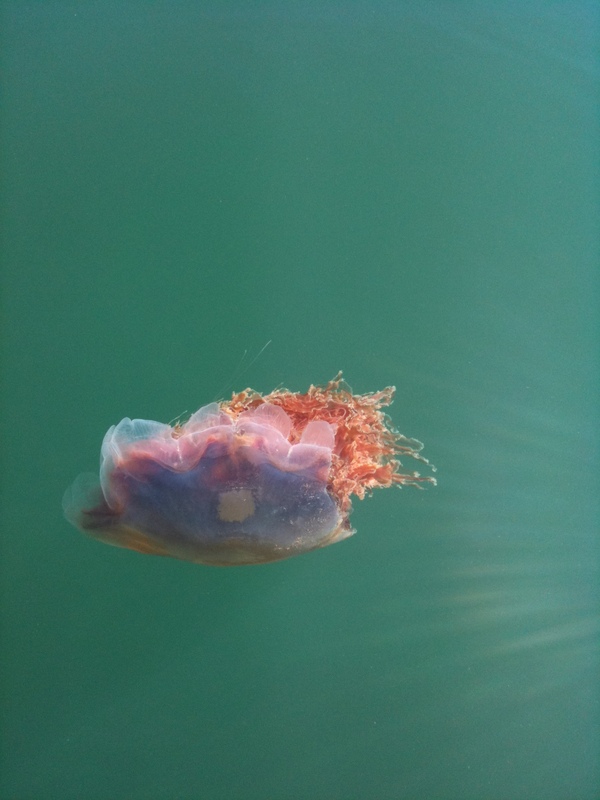 This lovely Lion’s Mane jelly was floating under our dock at Victoria Waterfront Tours last summer. I was lucky to get a great picture of it as it undulated by. Have you ever had a really good look at just what is under all those docks stretching out into the ocean? You might be surprised at the amazing biospheres that grow under there! They kind of seem “yucky” at first glance, but if you know a little about who is clinging to the undersides you might be intrigued. 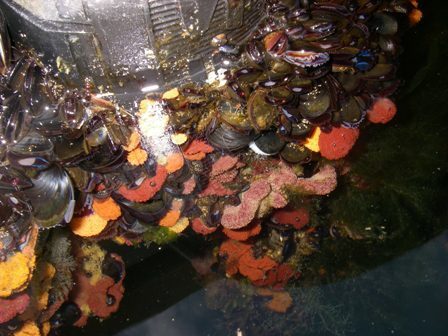 One of the most common inhabitants and one of the most fascinating is the tube worm. These are mouthless, gutless tubes that look very plain and unnoticeable – until they come out to feed! Then you see the beautiful, flower-like trophosomes that hold the microbes that help the tube worm eat. They come in an array of colours and sizes. If you accidentally brush up against the tube worm when it is “blooming” you can watch it shrink quickly back inside its tube. Fascinating! Of course every dock has a multitude of barnacles, muscles, clams and shells growing their own community in a protected, often overlooked place.They remind me of living sculptures with each one being very different and very lovely. Biosphere under the dock. A collection of muscles, clams, barnacles and tube worms. It can be quite beautiful. Be sure to take a look under the dock the next time you launch your kayak or boat. You may get a pleasant surprise! « You are a Star!